We’re just one week away from the world premiere of Rogue One: A Star Wars Story, and to commemorate the film’s release in theaters Dark Ink Art and Acme Archives Limited have released some of the very first officially licensed screen prints for the movie. This new batch of movie posters includes the ominous “Rogue One” by Mark Daniels featuring the all of the Imperial bad guys in the film. “Rogue One” by Mark Daniels is a 12”x24” hand numbered Rogue One: A Star Wars Story screen print. 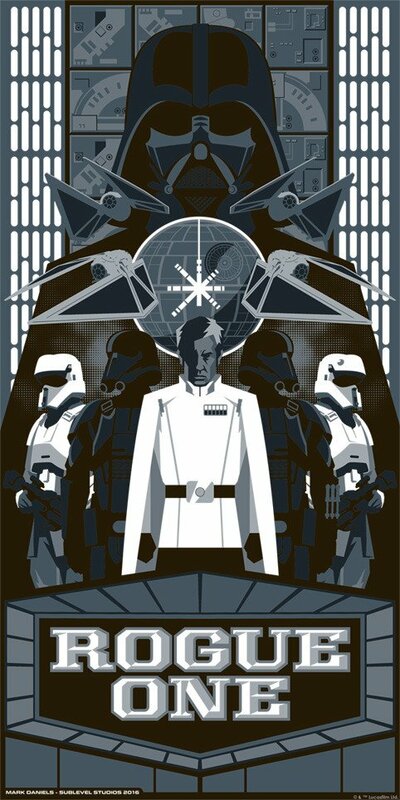 Limited to 200 pieces, collectors can purchase this officially licensed Star Wars poster now at the Dark Ink Art online store for $50.